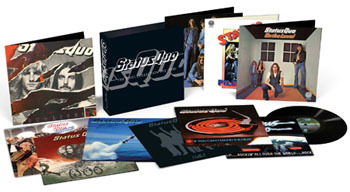 Share the post "Album review: STATUS QUO – The Vinyl Collection 1972-1980"
If classic Status Quo were personified by denim rather than leather, they were also defined by vinyl rather than CD. It may be somewhat bizarre that 40 plus years after the original release of the earliest album in this collection, we have a complete set of 180gm discs spanning the years 1972-1980. But, hey, that’s “progress” and – in the music industry – anything is possible. From 1972′s Piledriver to 1980′s Just Supposin’ this 10-album collection has been remastered from the original tapes. Piledriver marked a further stage in the band’s journey to a more hard rock based format and includes ‘Paper Plane’ and an excellent cover of The Doors ‘Roadhouse Blues’. Hello (1973) consolidated their early seventies success and is a fan favourite. It includes the hits ‘Roll Over Lay Down’ and ‘Caroline’. 1974′s Quo, also highly regarded, didn’t contain the ubiquitous hit singles. Instead we have tracks like ‘Backwater’ and ‘Slow Train’ which firmed up their reputation as a heads-down, no-nonsense boogie band. The following year’s On The Level yielded the band’s only No.1 single – ‘Down Down’ – and the album itself was the band’s first No.1 whilst Blue For You (1976) features ‘Rain’ and ‘Mystery Song’ which became staples in their live set for many years. 1977 saw the arrival of Andy Bown on keyboards and Rockin’ All Over The World gave us Quo’s signature tune that opened ‘Live Aid ‘ nearly 10 years later whilst the definitive double “Live” was recorded in Glasgow in late-October 1976. By 1978, which saw the release of If You Can’t Stand the Heat, and the subsequent Whatever You Want and Just Supposin’ the band’s sound had mellowed a little largely under the production wing of Pip Williams. This entry was posted in ALBUM REVIEWS, ALBUM REVIEWS (Mobile), All Posts, Reissues and tagged album, Blue For You, boxed set, Hello, If You Can't Stand The Heat, Just Supposin', live, On The Level, Piledriver, Quo, review, Rockin' All Over The World, Status Quo, The Vinyl Collection 1972-1980, Whatever You Want. Bookmark the permalink.